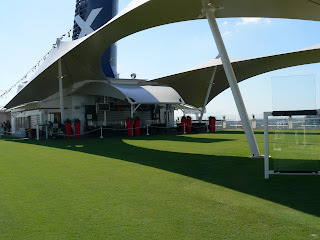 Being as skeptical and critical as I am, I did not board the brand new Celebrity Solstice for my Pre-Inaugural Cruise with any expectation other than it would be a solid, but similar, Celebrity product but in a megasize. I was very wrong! The Solstice impresses from the moment you board and Wow's you at literally every turn. 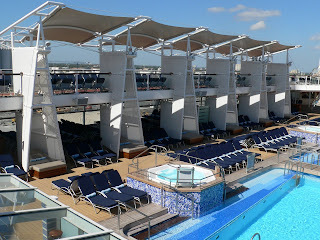 Simply put: The Celebrity Solstice is, overall, the most elegant and beautifully designed cruise ship I have ever been on. 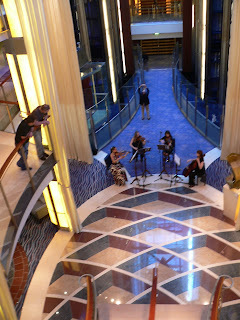 First, some perspective, as we take a short tour of the ship. The ship is very large. While you can have some absolutely wonderful, and true luxury experiences, all over the ship...you do have to walk, well, all over the ship. While it is a bit smaller than the QM2, it probably is the best ship to compare it to in the premium market (about 122,000 gross tons vs. 150,000 gross tons...which is actually a complicated measure of volume). However, the Solstice simply blows away the QM2 when it comes to design, style, fit, finish, amenities, elegance...well you get the picture. Even if you are traveling in Grill Class on the QM2, you need to stay in your "protected space" to have an upscale to luxury experience. On the Solstice, you can have it all over the ship. Specifically about the ship, I want to first mention The Lawn Club. I thought this was just hype and silly...that was before I boarded. 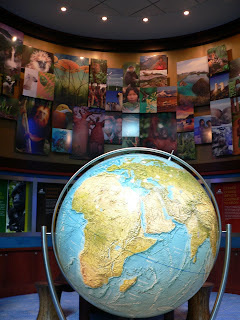 It is actually a really beautiful space where you get a wonderful feeling of peace and color (as it is is a painting). Little touches like beautifully shaped teak benches, huge flower pots that light up from within, arching canopies and the like make it a sensory feast. There is golf putting, bocce and other lawn activities. Yes, it sounds hokey, but it isn't. The Pool Area is also, while too large for me (personally) is absolutely beautiful and provides many nooks, types of shade, open spaces and things to see and do. If you look closely at the two photos you will see large beige beds tucked in between white sailcloth, the dancing waters fountain, lots of architecturally interesting details and style. What you can't see are the many different seating options, ranging from all-weather wicker chairs and lounges to hanging tented hammocks for two. What you also cannot see are the areas forward and aft off the Pool area. There are so many different places to sit, lounge or gather in groups. 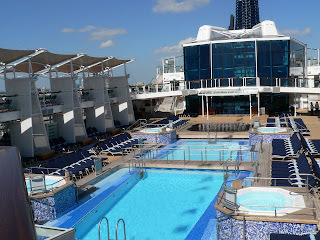 It really impressed me with not only the amount of open deck areas not involving the Pool area, but how many different types of seating, awnings, shapes, etc. Celebrity used. The Solarium is a beautiful space and also has many nice and creative touches, from dancing streams of lit water, to unique tented beds and a solar grid on its glass roof. It is also home to the AquaSpa Cafe for lighter lunches in smaller portions such as blackened tuna or chicken breast and an awesomely chosen salad bar. 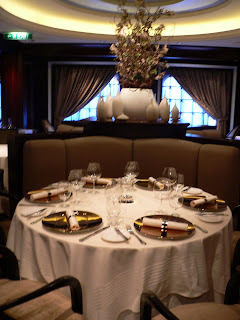 The main restaurant, The Grand Epernay, really didn't do much for me during the day. In the evening "the look" was there. 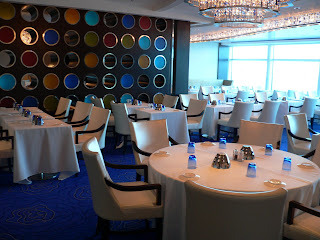 Elegance in a huge space with incredibly comfortable chairs, wonderful lighting and no sense of crowding at all. The chandeliers are unique and the wine cellar is awesome. 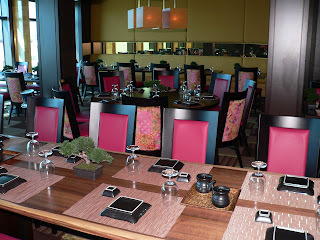 In the photo below it is the long tower at the far end of the restaurant and runs floor to ceiling. As for the food, whether it was a goat cheese and beet salad, roasted quail or a chocolate tower filled with a light chocolate cream creation, it complimented the room. Now, each speciality restaurant has its own personality and I am confident in saying is as beautiful as some of the finest restaurants on land. There is a reason for this: The restaurants were created by the top restaurant designers in the industry. I will talk about them more in another post, but in order of appearance below there are Murano (most formal); Tuscan Grille (steakhouse); Silk Harvest (Asian); and, Blu (AquaClass - more on this below). 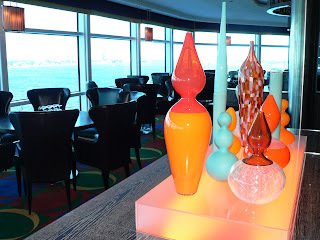 Although I do not have photos to share at the moment, the Oceanview Cafe and Grill (aka buffet) is also a winner. It is bright, clean, plays off of the colors of white and blue and uses - with great success - a number of islands in addition to more traditional buffet setups. This pretty much eliminates long lines (other than for fresh pasta) and with the lighting and presentation make the food very attractive. The food varies from Asian to BBQ to Mexican to Continental and are all clearly marked overhead (so you don't have to crowd areas to see what is there). And get this: There are actual bowls for salads! Missing: Trays! You actually bring a plate of food to your table and dine. Very nice touches. There are also other venues, such as Bistro on Five for crepes, the Mast Grill and Bar (pool food and drinks) and Cafe al Bacio for coffees and gelato. I also do not have, at the moment, photos of the Shopping Areas, but they are worthy of note. 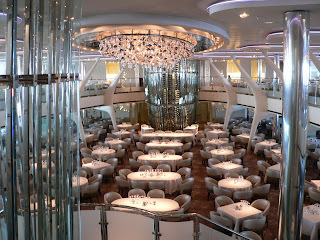 There are true shops, not ones filled with cruise line "stuff" and they are designed to look and feel like true boutiques and you may not only stroll through them, you can have private cocktail parties or intimate gatherings with an appointments. You have the sense of height, openness and style rather than low ceilings and tables filled with not so special "specials". I hope this concept works out. 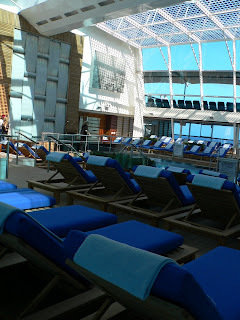 In my next post I will discuss the lounges and cabins.